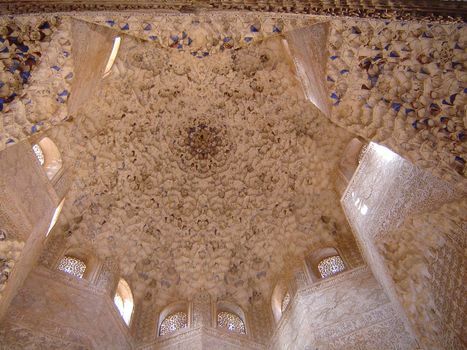 The palaces of the Alhambra rank high on most lists of Europe's cultural treasures, not for their size, architectural form, or materials but rather for their profusion of ornament on every surface. It's commonly explained as the result of a horror vacui. The idea is that Creation is never empty and that, with the right eyes, there is always something to see. 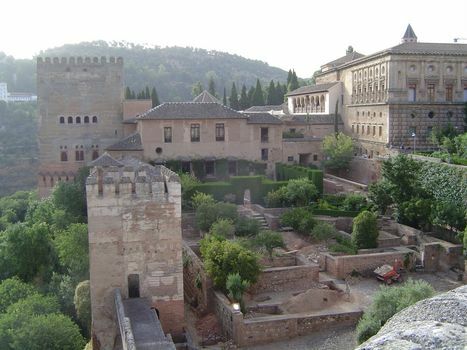 Only two of the Alhambra's six palaces survived into the 19th century: they are the ones flanking the never-occupied palace of Charles V., on the right in this picture. 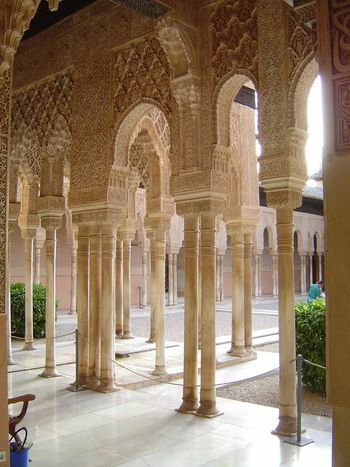 In order to build that palace, Charles knocked down some of the Nazrid buildings. The ruins of others lie in the foreground and still others are behind the surviving buildings. 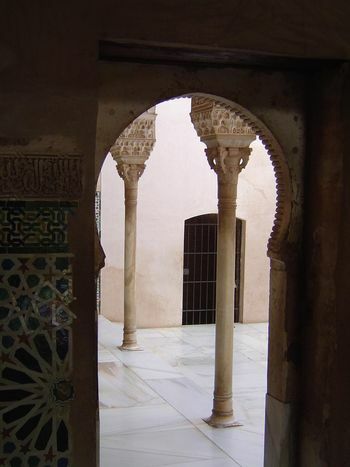 The palace exteriors offer no hint of what lies within, on the theory that external opulence attracts trouble. 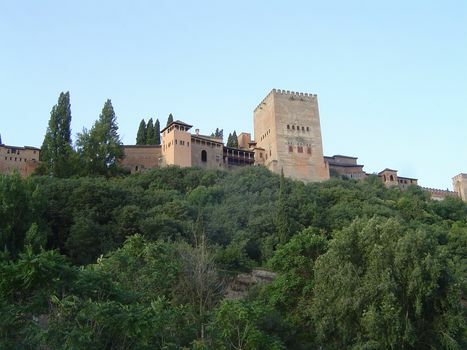 The view here is up from the Albaicin toward the palaces, particularly the massive Tower of Comares, containing the Hall of the Ambassadors. 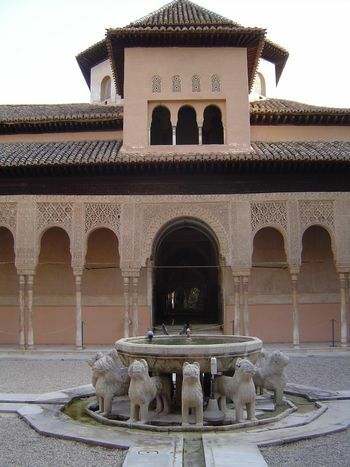 To its left is the Mirador of Lindaraja; behind it and invisible here is the Court of the Lions. 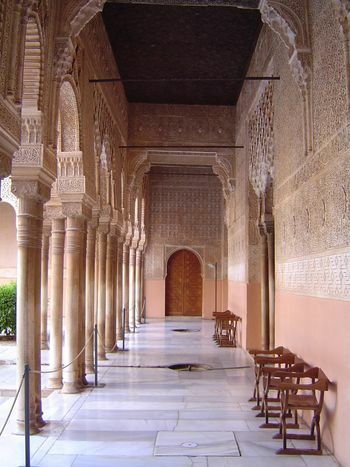 The sole and unprepossessing modern entrance to the palaces. It takes an artful visitor to take a picture like this, by the way: there's usually a line if not a throng of people. Beyond the door: the room known as the Mexuar. The Mexuar or council chamber became a chapel in the 1630s, when the wooden choir was added. In the background is an oratory. The windows of the oratory look across to Albaicin. 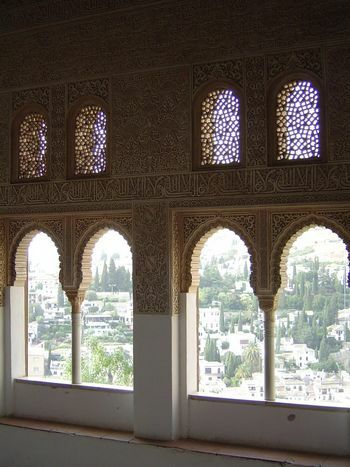 The jalis or tracery screens help cut the brightness of the summer sun. 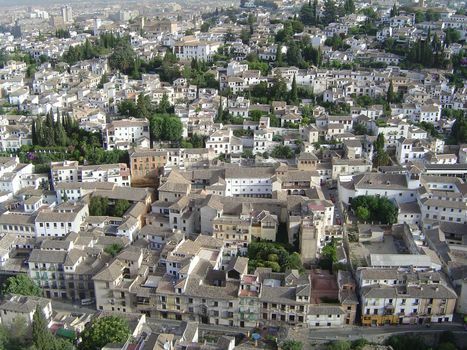 The view down into the old city. Looking back toward the entrance. 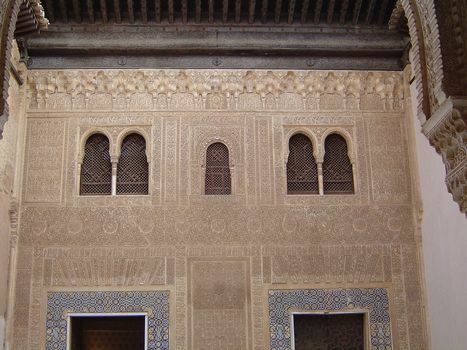 The original palace had azulejos, or tiles, but nothing so crude as these modern ones. 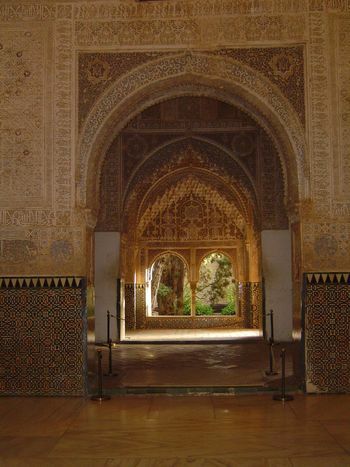 Entering the first of three courtyards, the Patio of the Cuarto Dorado or Golden Room. The tile here is closer to the Nazrid original and was probably moved here about 1540 from another location. 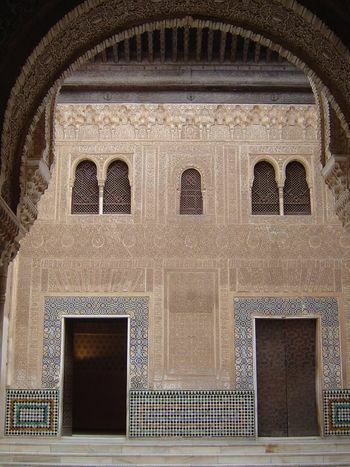 The Arabic inscription over the tiles reads: "Power is God's, Glory is God's, Dominion is God's." 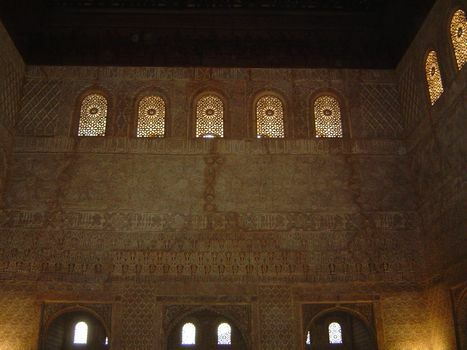 The south wall of the Patio del Cuarto Dorado. This was once the facade of the palace's main entrance. It's hard to make sense of that fact, because there's nothing behind the wall. That's courtesy of Charles V, who pulled down the palace that once lay beyond it and replaced it with his own very different palace. Why this cover-every-inch style of ornamentation? There's the horror vacui interpretation; another, not necessarily incompatible with it, sees this decoration as a translation into solid material of Arab tent hangings. 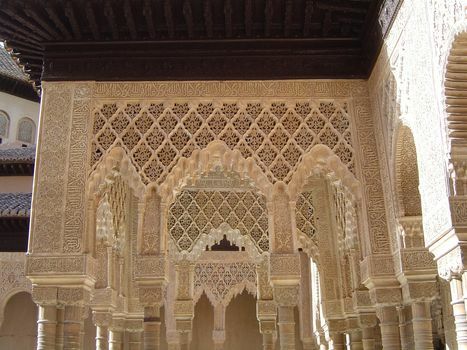 However it's explained, the Alhambra's ornamentation seized the imagination of 19th century Europeans: the Englishman Owen Jones, for example, in the 1830s made castings of every inch of the palace and lost a fortune publishing two immense volumes reproducing his work. 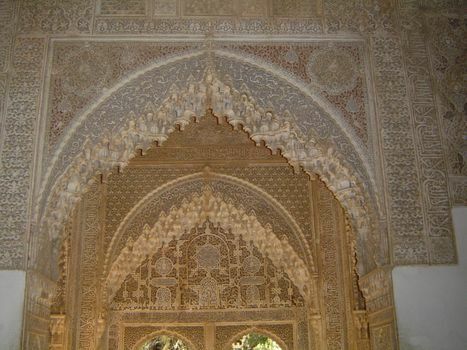 He went on, however, to employ the Alhambra's decorative flourishes--Arabesques--in British buildings such as London's Crystal Palace. The Arabic inscription is the famous "throne verse" (Sura 2: 255) of the Qur'an: "His throne extends over the heavens and the earth...." It appears as well at the top of the entrance to the Dome of the Rock in Jerusalem. 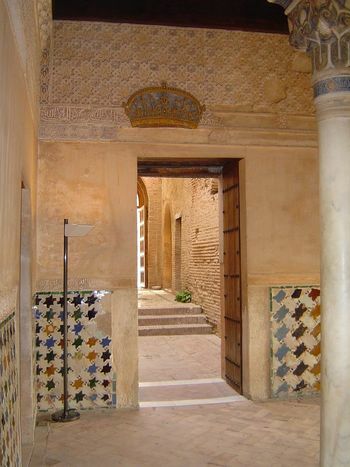 The north side of the same courtyard; the crude tile we saw earlier is in the passage entering on the left: beyond the doorway is the golden room. 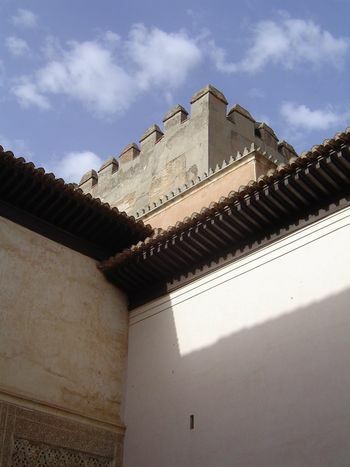 The spandrelled wall is at the lower left; the looming Tower of Comares lies off a second courtyard. 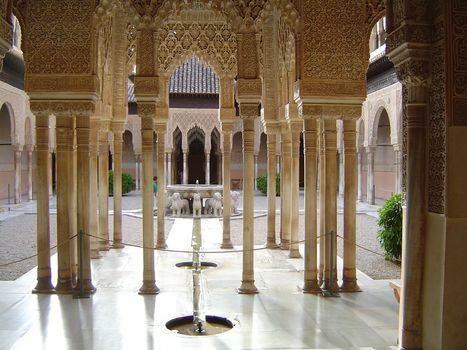 We've moved into that second or Comares courtyard. Again there are columns and spandrels. Richard Ford noted shrewdly that "the slim columns would appear unequal to the superincumbent weight were not the spandrels lightened by perforated ornaments." Another view of the same facade. 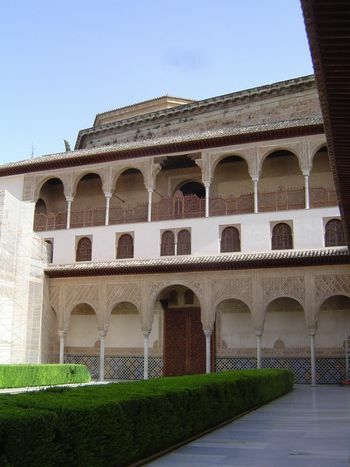 A third view of the same courtyard, this time from the Sala de la Barca, a summer bedroom looking south to the patio; behind the camera is the Comares Hall. 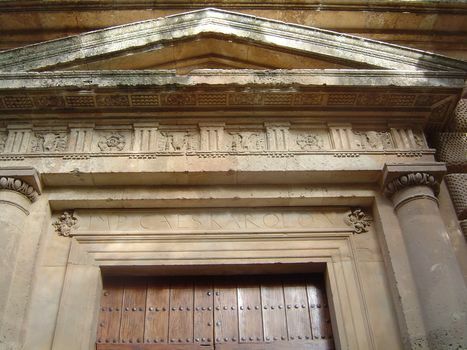 The Comares Hall is also known as the Hall of the Ambassadors. Here the sultan sat enthroned. 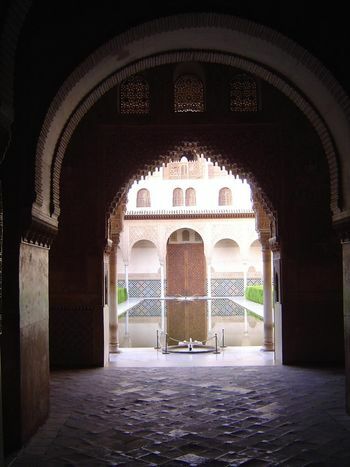 The third and last surviving courtyard, the Court of the Lions. A different view, looking diagonally. Looking across the Court of the Lions to the north and east sides. The east arcade. 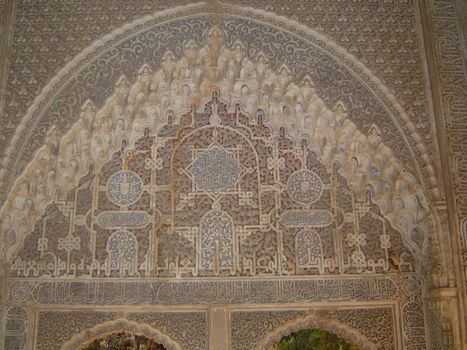 The diamond-shaped ornamentation is called sebka. The Hall of the Kings, or Hall of Justice, on the east side of the Court of the Lions. 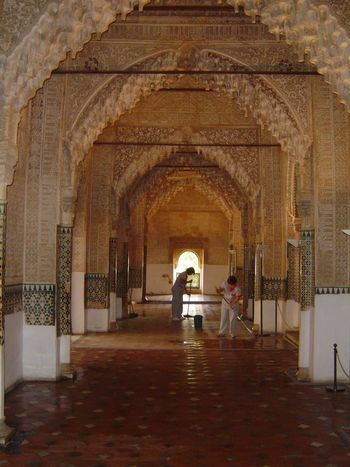 The arches are edged with muqarnas, a staple of Islamic architecture and found as far east as western China. 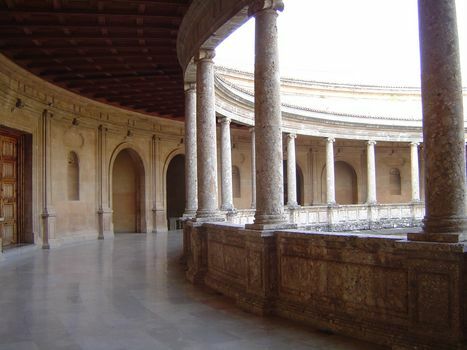 The south arcade around the Court of the Lions. 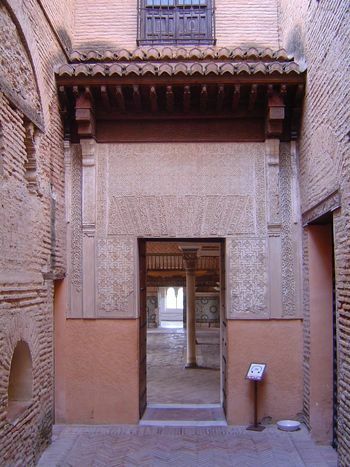 On the right is the doorway into the Hall of the Abencerrages. Rarely has a name been less honorific. The Abencerrages were rivals of Boabdil, who ordered their slaughter and piled their heads in this room. The dome of the Hall of the Abencerrages. 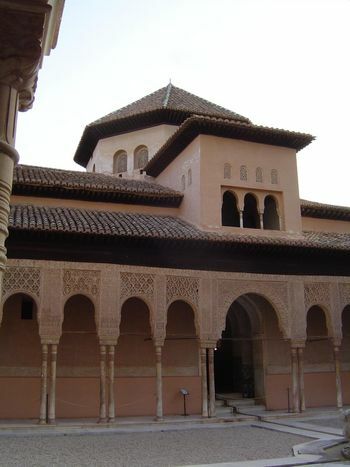 The north side of the courtyard: beyond the fountain are the Hall of the Ajimeces, then the domed Hall of the Two Sisters, and finally the Mirador of Lindaraja. Nothing much good has ever been said about the lions around the fountain; acerbic Ford said that their faces were "barbecued." 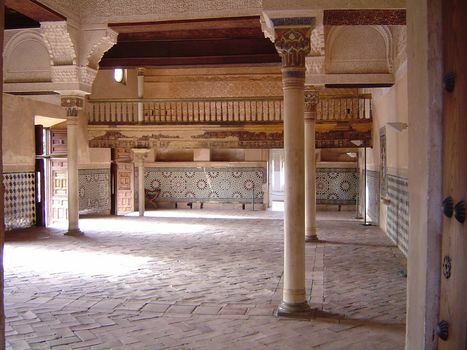 Still, there is an Arabic poem by Ibn Zamrak around the basin: "Blessed is He who has given this palace to the Imam Mohammed. In its perfection it is different from all others, because its rooms, in accordance with God's will, hold miracles that are incomparable in beauty." A different view of the same facade. 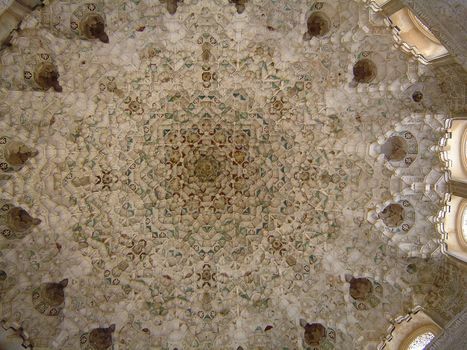 The Dome of the Hall of Two Sisters. An Arabic inscription in this room says: "Look attentively at my elegance and you will reap the benefit of a commentary on decoration." 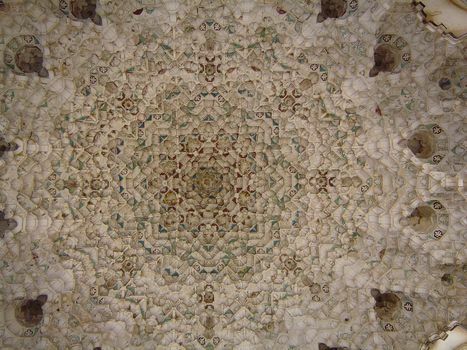 With 5,000 cells, this dome is reputedly the most intricate ceiling in the Islamic World. Looking into the Mirador of Lindaraja. The name is a probable corruption of ayn dar A'isha, or "eye [window] of the house of A'isha," a favored concubine. A detail of the room. A closer detail. 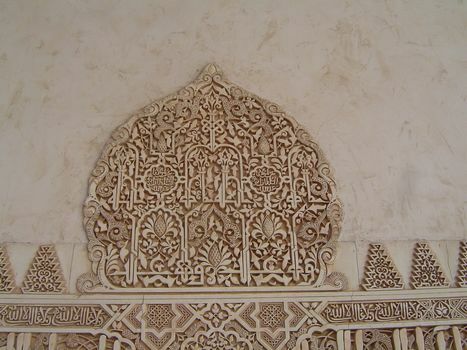 An Arabic inscription here reads: "Praise to God! Delicately have the fingers of the artist embroidered my robe after setting the jewels of my diadem. People compare me to the throne of a bride, yet I surpass it in this, that I can secure the felicity of those who possess me." 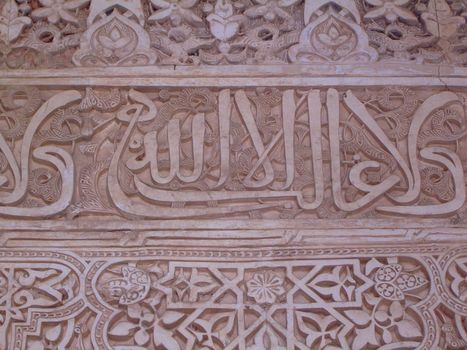 Throughout the palace complex is this Nazrid motto: "There is no conqueror but God." It's a phrase often attributed to Muhammad I as a sign of his exemplary humility. Perhaps he actually said it, but if so he was merely saying what millions of Muslims before and after him have said. Such self-effacement did not exclude effulgent praise from others. 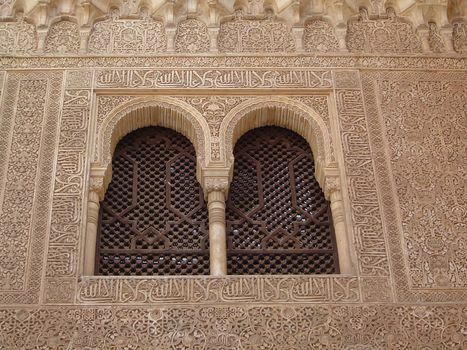 A wall in the Comares Court contains this poetic tribute from Ibn Zamrak to Mohammed V upon his victory at Algeciras in 1369: "The brilliance of your great deeds is shining at your door, exhaling the scent of happiness and jubilation." The beginning of the end of the Nazrids is often dated to 1393, the year Ibn Zamrak died. 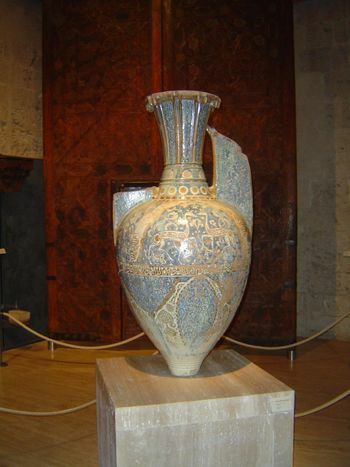 A broken but still beautiful decorative vase, about 53 inches high. Formerly on display in the palace, it's now in the museum in the adjoining palace of Charles V. The upper body shows a pair of gazelles; the inscription across the belly reads "good fortune and prosperity." 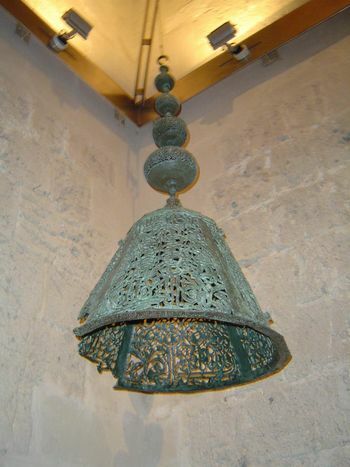 Also from the museum: a bronze lamp from the Alhambra's vanished mosque. The conical piece bears several inscriptions, including the formulaic "There is no Conquereor but God. Glorify his name." The lip of the lower rim has another inscription. Dated 1305, it says: "May the Almighty favor [him] beneath it, him whom my light illuminates with its splendor." 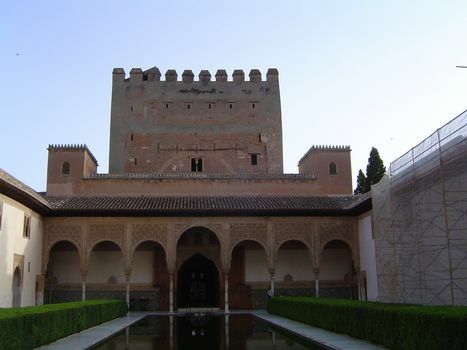 The palace of Charles V was egun in 1527 and located on the site of Nazrid palaces cleared for the purpose. 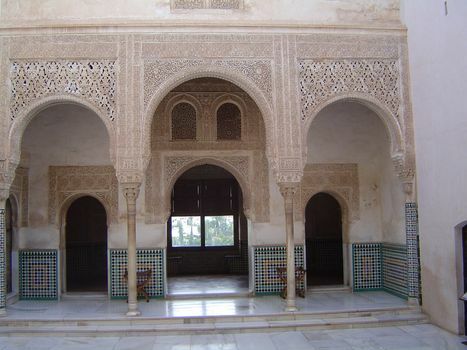 The palace was paid for by taxes levied on moriscos, or Christianized Muslims. (They had been given the choice of paying for it or receiving a visit from the Inquisition.) 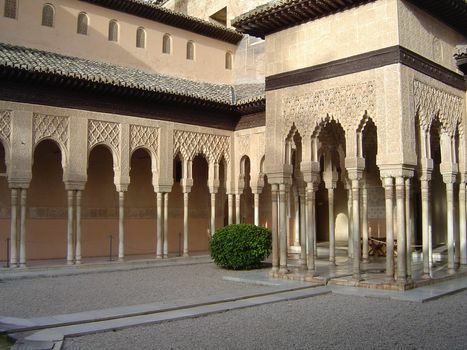 The palace was designed by Pedro Machuca, who had trained with Michelangelo but had never built anything. It was never used as a royal residence and was abandoned in 1631. Never one to mince words, Ford calls it "a square incongruous abortion." 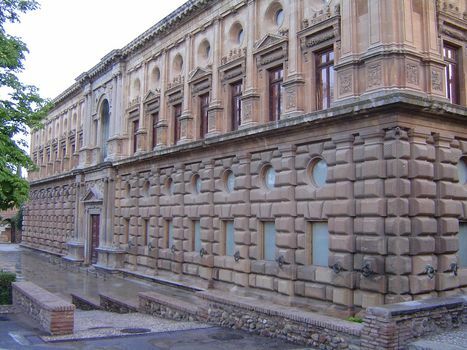 David Watkin, a classicist, writes to the contrary that it was "inspired by Bramante" and, if completed, "would have been the finest high renaissance palazzo in Europe." The inscription "Charles V, king-emperor" is a reminder of Spain's power at the time. Perhaps Ford is too harsh: inside the square exterior there is a circular interior courtyard. 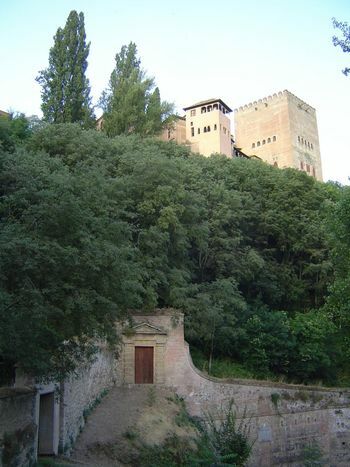 Looking up at the palaces from the slope at the foot of Lindaraja and the Tower of Comares. Numerous old entrances, like the one shown here, are now permanently sealed. The parking lots and ticket office are over on the other side of the ridge, but you really don't want to see them.